QUEENSLANDERS left the drought to see Keith Urban in Brisbane last night and boy did he bring the rain. Caboolture's favourite son flooded the Brisbane Entertainment Centre with love, hit after hit, and euphoria to country folk doing it tough. His connection with the crowd started from the get-go as he took out a pair of binoculars and even a floodlight to read signs throughout the 8500-strong crowd. As Urban often does, he created a night one Caboolture hairdresser will never forget when he spotted her sign asking him to come to her salon. Kelli, from Uniquely You Hair Studio, said in the sign that her clients bet her that Urban wouldn't come to the salon. He brought the blonde haired Elimbah local onto the stage, chatting to her about her salon and friends in the crowd. "I don't even know where Elimbah is. I used to live in Caboolture, I don't know where the hell Elimbah is." Just past the showgrounds, she tells Urban. "You've got a man in your life, I see, let's call him." She told him that wouldn't be such a great idea because he got up at 4am to work. 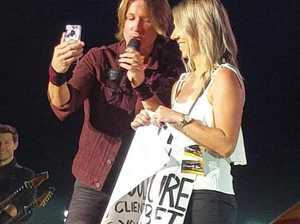 Keith Urban makes a Caboolture hairdresser's night: Keith Urban made a Caboolture hairdresser's night at the Brisbane Entertainment Centre, bringing her up on to the stage for fun chat. "4am! Let's definitely call him,'' Urban jokes. Instead he created a selfie video message on her phone for Mat. 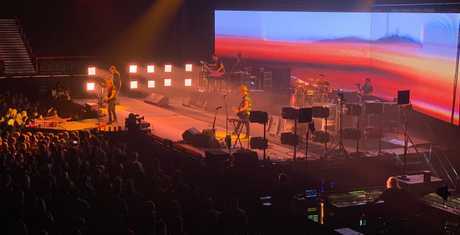 The exchange set the tone for a show where Urban continually engaged with his Queensland fans, often thanking them for how beautifully they were singing. 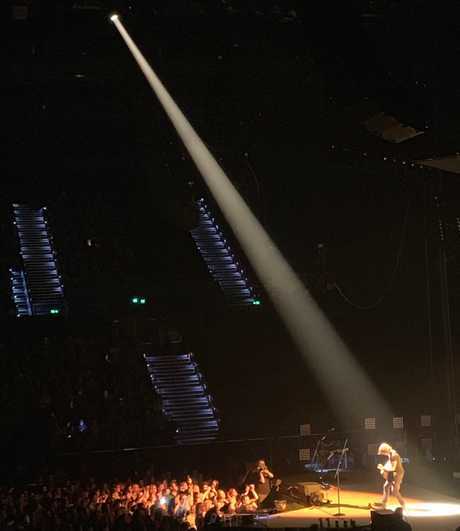 He rewarded their energy by moving through the arena, high fiving fans along the way before setting up on a second stage where he signed and gave away the guitar he was playing to a young girl. 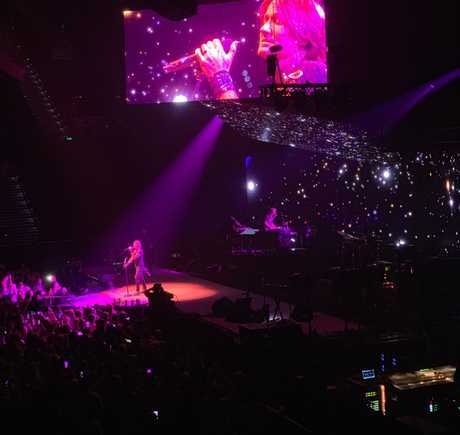 Talented singer and songwriter Julia Michaels earlier set the tone for a fun, high energy evening coming out in little more than a black Harley Davidson t-shirt and sneakers of different colours. She bounced around the stage, giggled and loved on the audience while playing her own songs and medley of others she had written for others. Urban took the show to a whole new level - and kept taking it up a notch, opening with Never Comin' Down from his Graffiti U album before having fans join him on his hit Days Go By. 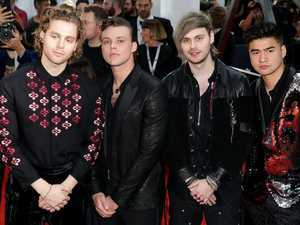 Urban told fans his mum and brother were in the crowd along with fellow musician and mate Lee Kernaghan. "My mum is here, my brother is here and so is my nephew, niece, cousin and a tonne of people I used to play with," he said. "Lee Kernaghan is in the house … so is Rod Williams who I used to play with and learnt a lot from." But wife Nicole Kidman was not at the show, with Urban jokingly pointing out one bloke leaving the auditorium. 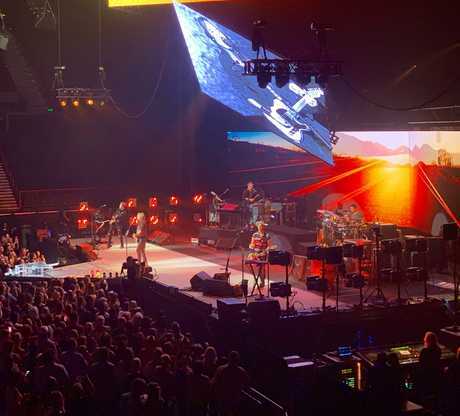 The four-time Grammy winner brought out big screens, perfectly mixed sound and a spectacular light show to provide the big time experience his fans have grown to love. But it was his raw vocal talent, along with that of his fellow band members, and guitar genius that continued to wow. Urban may be 51 but he oozed boyish charms and incredible energy as he pivoted from slow, moody numbers like Stupid Boy to his faster country rock hits. 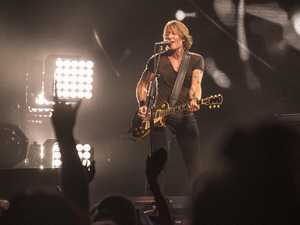 Keith Urban at the Brisbane Entertainment Centre: Keith Urban put on a huge show at the Brisbane Entertainment Centre and demonstrated his incredible guitar skills. Julia Michaels rejoined Urban on stage for a beautiful duet of Lie to Me before he launched back into a high energy number with a psychedelic light show. Urban knows how to mix it up, even throwing a big of Stevie Wonder's Master Blaster into the set, along with a brief outing on U2's With or Without You. But it was songs like The Fighter and Love Somebody that had fans mouthing every word. "You are giving it tonight Brisbane,'' Urban shouted, pumping the crowd up even further. "Seriously good energy,'' he added, saying he loved "passionate, intense, loud, rowdy" fans. After ending the two hour spectacular with Wasted Time, Urban returned for an encore, dressed in a Queensland State of Origin jersey. I took a mate of mine to the show who is a big fan of live music, but not necessarily Keith Urban. He was blown away. He described it as being 'held hostage' by Urban's musicianship, guitar breaks and vocal excellence. As he put it, if you're asking yourself if you should see Keith Urban in concert, the answer is yes. Urban plays in Brisbane again Friday and Saturday night night before finishing the Australian leg of his tour with two shows in Melbourne on February 5 and 6.